Our friends at E2046 have sent along some new photos from their setup at Wonder Festival 2014. 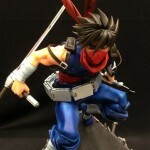 Included is a great looking Strider Hiryu from the Strider game series by Capcom. Some other items on display include a new Sorceress from the Dragon’s Crown video game, the Asuka with Motorcycle, and much more. They have also revealed a new Frankenstein’s Monster Bust. Read on to see a few photos. You can check out the full gallery at the E2046 Facebook Page. Please keep in mind that some of the collectibles may be considered NSFW.